All of the teak work has just been completed & looks beautiful on this Hatteras. If you are in the market for a 60' Motor Yacht, contact me today & schedule a viewing! The boat slip at the Ocean Club in Port Canaveral is included in this price & they are no longer selling slips. Lynne Marie llhas been professionally maintained& powered with1,000 HP Caterpillar C18engines. Optional features include an enclosed custom settee & teak flooring.Lynne Marie ll iseasy to show withdirect ocean access inPort Canaveral, Florida. Don't miss out, contact me immediately! United Yacht Sales New Jersey would love to guide you through a personal showing of this 60' Hatteras 60 Motor Yacht 2010. 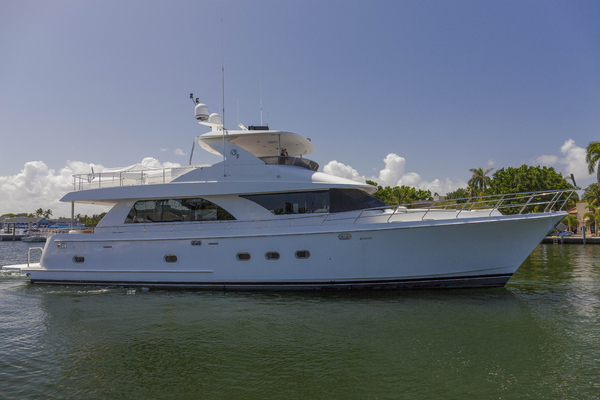 This yacht for sale is located in Ocean Club, Port Canaveral, Florida and priced at $1,899,900. For a showing please contact us by filling out the form on this page and we will get back to you shortly! With input from dozens of Hatteras customers plus owners of competitive products, Hatteras redesigned the 60 Motoryacht's interior spaces and added square footage in the galley and salon with an innovative approach to layout and construction that makes her the largest 60 foot motor yacht you've ever been on. The unique design theme that flows throughout the boat combines exotic woods with dual tone wall coverings and padded panels. This creates a continuous and open environment that leads you gracefully from the aft deck all the way to the full-beam master and beyond.These sweeping changes do not stop at the salon door. The Hatteras design team created a fresh look for the exterior with minor tweaks to the window lines, and the elimination of the engine room vents in the hull side. The flybridge is also improved with a tinted windscreen and a modified deck layout to maximize entertainment space up above.More space and more luxury usually come with more expense, however this model competitively priced when compared against the competition. The best place to take in the sights on the 60 is clearly the flybridge, where beautiful views, fresh air, and easy-going entertainment areas provide a brilliant backdrop for any cruise. This layout features a centerline helm with triple chairs and space for multiple flat-screen displays and navigational aids. Guests can spread out and socialize on big benches to port and to the stern. 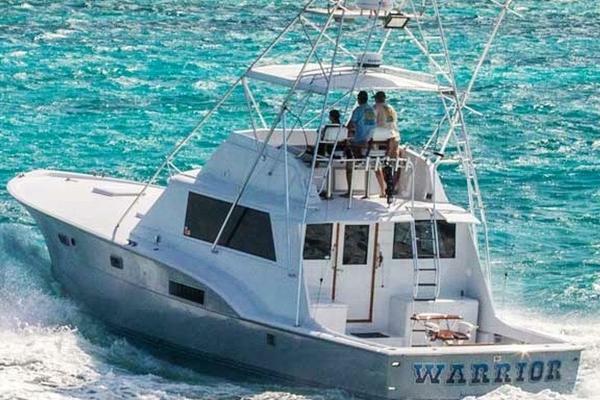 This Hatteras is equipped with an optional davit and dinghy (up to 10 feet) on the aft overhang. Athree-panel glass door framed in stainless steel slides opens to allow entrance to the 60's airy salon (the panels stack to port and create an extra large, patio-like portal to the aft deck). The salon itself features a large sofa opposite a smaller settee - perfect for casual conversation. A 36-inch flat-screen TV is mounted under the galley countertop, and oversized frameless windows provide an unobstructed, panoramic view of the horizon all around. Owners who plan to spend a lot of time aboard will definitely appreciate the full-beam master stateroom with tapered king-sized berth, vanity to starboard, and large atmospheric portlights. Cedar-lined hanging lockers and twin dressers provide abundant storage for traveling clothes and gear, and the 19-inch flat-screen TV and stereo speakers offer low-key entertainment after a long day. To port, a private head with solid-surface countertops also includes a shower or full-size tub with tempered glass sliding door, owner's choice. The 60 features two generous guest cabins, one in the bow and one to port, with a shared head on the starboard side. A spacious VIP stateroom forward features a tapered queen berth that lifts to reveal a cedar-lined storage compartment below. Another cedar-lined hanging locker and a pair of cabinets provide additional stowage for extended voyages. The remaining stateroom has twin crisscross bunks that are ideal for kids or crewmembers. A single step up from the salon leads to the U-shaped galley and country kitchen. Highlights here include solid-surface countertops and backsplashes for long-lasting durability, as well as an upright refrigerator/freezer, two-burner cook top, convection/microwave oven, and stainless-steel sink. Custom cabinetry with a rich mahogany finish provides a luxury feel and loads of storage for food, silverware, and cookware. A large, circular dinette to port calls to mind a casual country kitchen typically found on larger yachts; it provides seating for six. For those who prefer a lower helm, one is available as an option in lieu of the country kitchen. Like all Hatteras models, the 60 is founded on a solid fiberglass bottom that includes sturdy support in key areas like the hull tunnel, shaft log, and strut locations. Divinycell coring is infused into the hull sides, decks, and superstructure to add stiffness and reduce weight. The hull also benefits from an advanced variable-deadrise design that utilizes large propeller tunnels to reduce draft and increase efficiency. Whether entered through the aft deck hatch or the optional bustle door in the transom, the heart of the 60 lies in her spacious engine room. Overhead clearance is unbelievable, granting unhindered access to the standard twin Cummins QSM-11 diesel engines (705 hp) or the optional twin CAT C18 diesel engines (1,000 hp). The fuel tank, located close to the center of buoyancy, distributes weight evenly for improved performance and efficiency as fuel is consumed. Down from the flybridge, the 135-square-foot aft deck is bigger than those found on many larger motor yachts. A molded, curved settee runs the length of the transom and provides quick access to the swim platform from either side. A second aft deck design eliminates the standard aft bulkhead and instead uses stainless-steel railings and tempered, laminated glass to encase the deck. This arrangement provides more usable space and allows for the installation of an optional passerelle and davit to facilitate Mediterranean-style mooring and dinghy storage on the swim platform. Side decks measuring almost 13 inches across make working the lines easy and safe on the 60. These side decks also provide access to a storage locker on the port side and lead all the way forward to a molded bench seat on the bow deck.